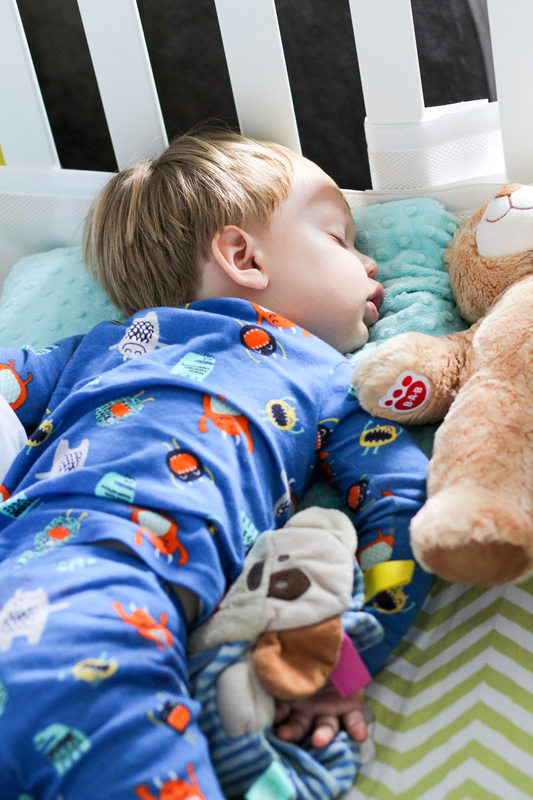 If you are one of those parents who's children has never struggled with sleep issues, this post is not for you. Also, I hate you. Just kidding. But kind of. Jacob has had his fair share of sleep trouble - it started the second night after he was born in the hospital. He'd wake every 30 minutes or so, then cry and refuse to sleep until we rocked the little clear bassinet back and forth. The nurses insisted he was just cluster feeding and that he'd do better once we were home. But he wasn't any better at home. He hated to sleep flat on his back so we ended up using the rock and play with him. And then he stayed there for the next 8 months. At 8 months we sleep trained him in his crib and he started sleeping through the night in there but naps were still a mess, often lasting only 20-30 minutes. Finally after his first birthday I went on summer break from my teaching job and was able to work with him and get him on a consistent schedule napping for 90 minutes twice a day. His wake up times were still pretty early at that point, but at least he was sleeping through the night and napping on schedule. We'd hit bumps every so often when he got sick or was teething, but for the most part things were well in the sleep department. Sometime before his second birthday he dropped his second nap and moved to one midday nap for 2-3 hours. This didn't seem to affect his nighttime sleep at all. Then, shortly after his second birthday, we potty trained. Starting then, if he would wake up at night we would get him out of bed and take him in to use the potty, whether or not he asked to. Then, some time in late fall he got really sick and was requesting water all night long. Because he was sick we felt as though we needed to go in there every time he cried and give him water. But once he got better, he still woke up all night long either requesting water, or just crying until we went in there to tell him to go back to sleep. It's not that he wouldn't go back to sleep. It's that we had to physically get up out of bed and go in and tell him to go back to sleep (or give him some water) to make it happen. This was happening 4-5 times a night. For months at a time. We were exhausted. We were grumpy. And guess what? So was he. He started protesting bedtime. Claiming he had to go potty even when he didn't and then sitting on the toilet for forever doing nothing. He started screaming and trying to refuse baths. And when it was time to go to bed he protested that too, requesting more water and holding the straw in his mouth for forever but not actually drinking to keep us in the room longer. I turned to everyone I could. I text friends and family, and posted all over social media asking for help, and our tribe SHOWED UP. You listened, you offered advice, and you just plain commiserated, because even if it isn't sleep issues - no kid is perfect and we've all been frustrated parents dealing with something. And we are crazy thankful. There is such relief in knowing that someone's got your back and has been there before. We got quite a bit of really good advice and started implementing some of it right away. I'm not sharing this with you because I think it's a cure all, or because I'm boasting that we've (mostly) cured our kids sleep issues. I just want to share with you what we've learned so that if you're there - struggling all night with wake ups, perhaps some of these ideas will help you too. First, we learned that bladder control at 2.5 is not great. And that by getting him get up to go potty whether he says he has to or not is not helping him have better bladder control. It's just teaching him to wake up at that time out of habit. Nothing is going to help improve bladder control except time and muscle maturity. We cut out night time bathroom breaks, continuing to make sure he goes right before bed. Second, we made the decision to leave the water bottle in the bed. Since that was his number one request, we thought if we left it there he might drink and fall back asleep. The first night I told him I was going to leave it he cried "no water, no water!" I left it anyways. He slept through the night and in the morning, the water bottle was full and his pull up was dry. He hadn't drank any of it. That's when I realized - he wasn't crying for water in the night because he was truly thirsty. He was using water as a crutch to get us back in the room because we felt guilty that he was thirsty and crying about it. As soon as we started leaving the water, he started sleeping through again without crying for it. You can't cry for what's already there right? Third, we learned that we should reassure Jacob of our plan and then STICK TO IT. We tell him before bed every night that we expect him to sleep through the night without crying and that once we tuck him in we will not be returning. We feared the worst the first night, that we may be in for hours and hours of crying before he gave in and realized that no, we meant it and we are not coming back in. He didn't end up crying at all, but we were prepared to stick to our guns if he had. And we will in the future if he does. As long as you know that your child is safe and their needs are met, it's ok to let them cry until they understand that you mean business. In our case, it had truly become a power struggle and he was crying not because he needed anything, but to manipulate us back into the room. Yes, they are capable of that even at 2. If crying is not for you, that's fine! You won't get any judgement from me. We all have to decide what is best for our families. Now that we have night wakings under control, it's time to finally face another problem we've had for quite some time. Too early morning wakings. Jacob will often wake between 4:30 and 6, instead of between 6 and 6:30, and be ready to go for the day. He'll genuinely think that it's morning and unless we go in and tell him it's still night time, he won't go back to sleep. We're thinking of trying an OK to Wake clock, since he has a very good understanding of stop lights and "green means go." We already have black out curtains that keep it very dark in there, a blankie with ribbon tags that he rubs for comfort, and a sound machine that drowns out any morning noises, like the shower running when I get ready for work. If you have any other tips or ideas to help the problem I'd love the hear them!! !